Bake a cake from a mix or from scratch and cool completely. Crumble cake into a fine consistency into a large bowl. TIP: If the texture is too coarse, you can run it through a food processor. 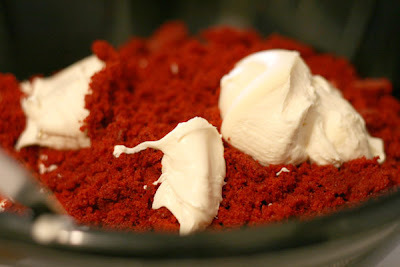 Add can of cream cheese frosting or homemade frosting and blend together using the back of a large spoon. Blend thoroughly. 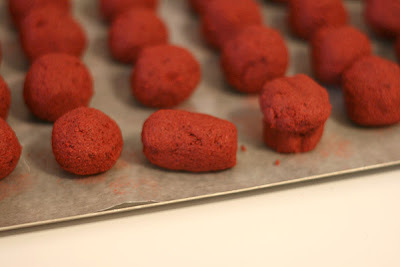 Roll mixture into 1.25″ – 1.5″ size balls and lay on wax paper covered cookie sheet. You may want to periodically rinse and dry your hands off in between. Cover with aluminum foil or plastic wrap and chill in refrigerator for several hours. TIP: You can speed this up by placing in the freezer for about 15 minutes. Remove. 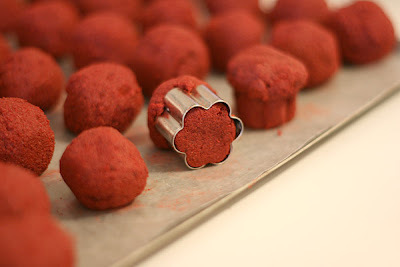 Begin to shape into cupcakes using a small flower-shaped cookie cutter. (see below) Take the chilled ball and roll it into more of an oval and then slide into cookie cutter. Push it into cutter until about half fills the cutter and the rest sticks out of the top in the shape of a mound. 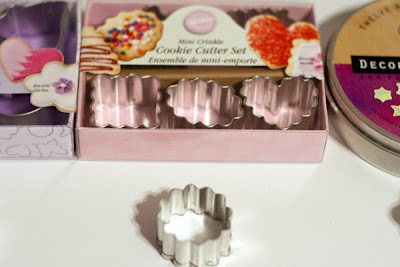 Then push the shaped cupcake carefully out of the cookie cutter from the bottom. Set right side up on a wax paper covered cookie sheet. Continue with remaining balls. While cupcake shapes are chilling, begin to heat up your chocolate bark. Brown chocolate bark for the bottoms. 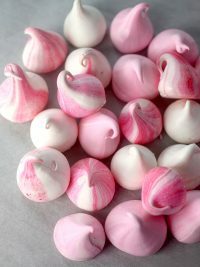 Pink or white chocolate for the tops. Follow the instructions on the package for melting. Most recommend heating for 30 second intervals at a time and stirring in between. You can also do the double boiler method. When you are ready to dip, remove from freezer and set up another wax paper covered cookie sheet. Take the cupcake shaped mixture and dip bottoms into the melted chocolate – just to the point where the mounded shape starts. Remove from chocolate, turn upside down and wiggle so that the excess starts to slide down slightly. Then lay on the wax paper upside down. 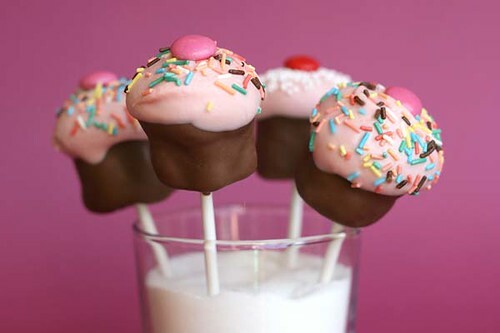 If you want them to be lollipops, then go ahead and insert the lollipop sticks while the chocolate is still wet. Continue with rest of the cupcakes. You can also leave some without the sticks. They’re just as cute as Cupcake Bites. 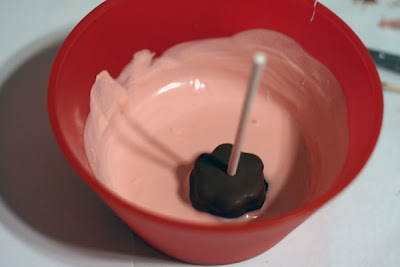 TIP: Dip end of your lollipop stick in the melted chocolate before inserting into chocolate bottoms. Not sure if this helps a lot, but it couldn’t hurt. DON’T – get water in the chocolate. Make sure your hands are completely dry. Water will cause the chocolate to separate and mess up all your hard work. Once dry, dip the tops of the cupcakes in the pink or white chocolate. You may need to move it around a little to cover all the exposed areas. 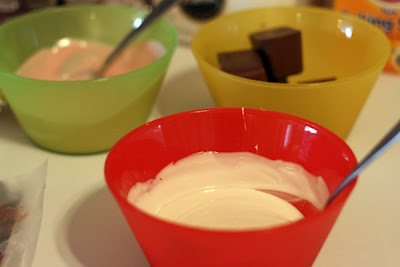 Remove from the pink/white chocolate and turn right side up. You may need to hold and rotate it if there is any excess so that it doesn’t drip down too far. TIP: You can use a toothpick to help cover any areas the melted chocolate didn’t cover. For the Cupcake Bites – just turn right side up and rest on the wax paper. Then go ahead and put a m&m on the top and add sprinkles while wet. For the lollipops, Continue holding and place an m&m on the top and add sprinkles. Let them dry in a styrofoam block that you have already poked holes into. When completely dry, cover the lollipops with small plastic treat bags and tie with a ribbon. 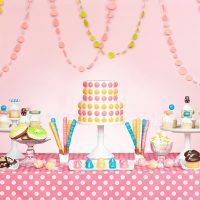 For the Cupcake Bites, place in a candy cup and package in small candy truffle boxes to present individually. First Choice – this size (1.25″ wide), mine was made by Williams-Sonoma. Not available online anymore, but you might get lucky and find one in their stores. I’d call first. I’m sure another brand makes one this size, too. Second Choice – Crinkle Cutter – Wilton (1.25″ wide) Works really good. 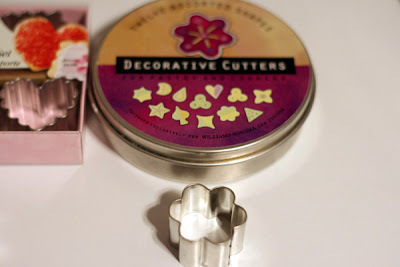 Third Choice – Flower Cutter – Wilton (1.5″ wide) You can use this one, but you will probably want to roll your balls a little larger and use the thicker lollipop/cookie sticks for support. Instructions illustrated with a Red Velvet Cake. This photo is with a chocolate cake. Next Post Chocolate Chip Cookie Pie… Oh My! Jennifer – You’re right, they definitely have a wow factor. HelloxDiana – send pics if you do. hi bakerella, do you know what the longest amount of time you can keep these are? i want to make them earlier for a party (as early in advance that i can), but not sure how long they will last. if you know, please let me know! thanks! I have eaten them almost a week later using a box mix and ready made frosting and they still tasted moist. But I probably wouldn’t go longer than that. I made them for my daughter’s first birthday party (which had a cupcake theme) and they turned out GREAT! Check out http://majagent.blogspot.com/2008/06/cute-as-cupcake.html to see a photo! Thanks for sharing your super ideas. I just made your pop cupcakes earlier this week! Bit time consuming but I like them! jenn gent – they turned out great. spamalicious – these look yummy, too! Anonymous – good luck. Don’t worry about an extender. You’ll be ok with the cake mix and frosting. Thanks for all the ideas!!! I called wilton and they are not making the same set that you chow anymore. The closest one that is availabe is-Blossom Nesting Perimeter Cutter Set-It looks pretty close. 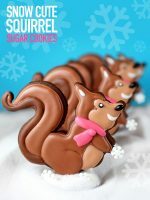 I am so excited to make these but I have to wait till they get here. Shelly – those won’t work. They aren’t tall enough. 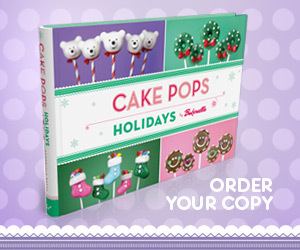 Also, keep checking in craft stores, because you might find one of the wilton sets there. I absolutely love chocolate and your cupcakes pops look amazing. I can’t wait until I try them out myself. Thanks for sharing the recipe! I’ll probably get lost in the list of your many admirers but I had to say you’re my FAV find today!I’ll love sharing your lil spot on my blog.the petite cuppy cakes are the perfect bite size confection and I can’t wait to bake em.Now I’m headin to Martha’s to see your visit there. Lynn – good luck with yours. Sara’s Sweet Surprise – hope the video helps. Heather – You don’t have to share, but you’ll have about 50. And it will be hard to keep people away – they’re so cute. Hi Bakerella!!! 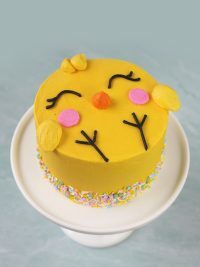 Thanks for sharing the most adorable cupake. I’ve tried out your popping recipe since i can’t resist the cuteness of those cupcakes. Just wondering, why is it after mixing the cream cheese and the cake, the balls were so oily which make it difficult to be shaped into cupcake? was it because i put too much frosting? Such great ideas, and awesome instructions. :) I was wondering, though, if the smallest blossom cutter in the Wilton Rose Bouquet Cutter Set (seen here http://www.amazon.com/Rose-Bouquet-Cutter-Set-Wilton/dp/B000FHHC2M?ie=UTF8&s=home-garden&qid=1174249060&sr=1-117) would work, or is it too small? 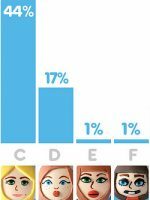 Just followed a link here for Digishoptalk.com.  It is my first visit to your blog and will definitely not be my last!! I love this idea! So cute and your instructions are fantastic!! TFS!!! lidia_san – it depends. did you make from scratch or from a box and use canned frosting? The box/can method is a little more dependable since homemade cake and frosting recipes vary. Next time, add a little less frosting and see if that helps. Jade – It might work. I haven’t tried it with a plastic cutter or with one that is angled, so let me know if you have success. Miss Chris – glad you found me and thanks! I love your husband’s expression. Awesome! DO u think we can use those cakes sold in the supermarket to skip the cake making step? mushroomgarden – I think that would be fine. 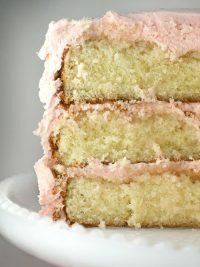 Either get one w/o frosting and add your own or if it has frosting, you’ll need to make allowances for the amount already on the cake when you add your own. can this be made with buttercream icing instead of cream cheese? I just made these over the course of two days and I’d have to say they are a lot of work! I made them for my friend’s birthday and couldn’t find red velvet cake anywhere and decided to get strawberry- everyone likes strawberry right? well, i just found out that my friend doesn’t like strawberry- strike one. i used your recipe exactly but i think they are a bit too moist, so next time i won’t use as much cream cheese frosting- strike two. and i really hate to say this… but mine are UGLY!! STRIKE THREE!! I wanted to make them “goth”, for my friend, so i tried to do red (on top) and black (on the bottom) cupcakes with black sprinkles, but decided not to mess with the color of the chocolate because so much had already gone wrong… so they’re brown and red now, with black sprinkles- not what i wanted. does anyone else have ideas for “goth” or Halloween cupcake pops? lauren – I feel for you. They are time consuming and you definitely want them to come out right after all that time. I’ll add goth to my list of pops to work on. In the meantime. 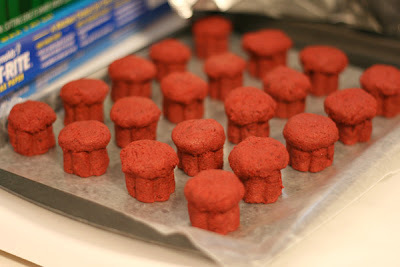 Just do red round pops and sprinkle with black non-pareils. I like Mr.Sprinkles and your cupcake pops. I love your site! 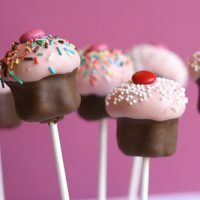 hi bakerella, i just have to say i love these cupcake pops. im having some trouble keeping them on the stick though. i think it is because i used too much frosting and also my sticks are plastic and not paper. otherwise, they are so delicious and are very cute. sandra – definitely try the paper sticks. And a little less frosting will help you too. Bakerella! I’m working on making your cupcake pops. I tried strawberry cake with cream cheese icing. So far so good! I started dipping last night in Wilton’s Candy Melts. UGH! This melts too thick. So I started reading through your comments and found I’m not alone. I did a search on the internet and they say to thin with a couple of drops of vegetable oil. This works great! Just though I’d share. I’m sure others that go with the candy melts will be glad to know they can be worked with. Thanks for this adorable idea. 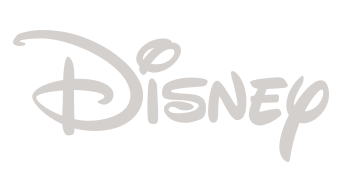 I can’t believe I’ve never read this blog before! I’ve been missing out! These are just what I’ve been looking for to make for an upcoming block party! Super cute and easy to serve and eat! Thank you! I weaved green tissue paper in between the pops to fill it out and make it look more like a bouquet of roses. My friend LOVED them- Despite my mishaps, I love them too. I made mine last weekend for my little princess’ full mth celebration. I gave to friends and the response was good! Maybe it was the brand of chocolate i used, the chocolate part began to melt a little on the 2nd day. but overall, they were pretty impressive. I have added some photos on my blog, as well as giving credit to you. Hi. I just made your cupcake Pops for my SIL Baby shower. They turned out cute but yours were way better. Thanks for sharing I will definantly be trying to perfect them. Stacey – Glad you made things work. You can also try paramount crystals to thin chocolate. mushroomgarden – what kind of chocolate did you use. It shouldn’t melt. But, I guess that depends on where you live. Urmston Family – they do get easier. 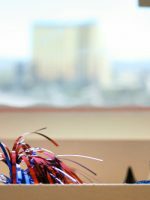 I wanted to show you how great the cake balls turned out! I’m so pleased. Thanks for the wonderful step by step instructions. They are delicious and beautiful! Hi. I so love your cutest cupcake pop. Will try to make them for my daughter’s 1st birthday. I would like to ask if I could use the regular melted semi-sweet and white chocolates to dip in? I don’t think I can find candy melts or bark here in our place. Stacey – I like the bows. Ging – You really need to use the candy melts. Or do you have chocolate bark in your area. You can also order them online from amazon. I want to make these for my sister’s baby shower – but the baby is a boy. Can I find blue melting chocolate somewhere or will the chocolate still be fine if I had blue food coloring? I guess I could do white chocolate with blue sprinkles…but I wonder where I could find those too. Any help would be great – thanks! hi, how much cream cheese do i need to add? 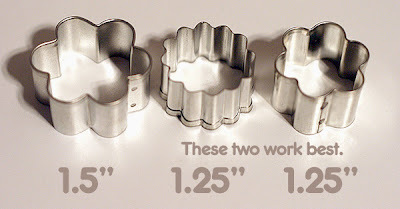 I stopped by Williams-Sonoma and lucked out – they had the right cookie cutters! 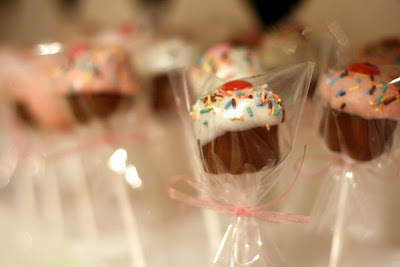 I can’t wait to try out the cupcake pops, and after I do I’ll definitely come share my pictures of what I make. 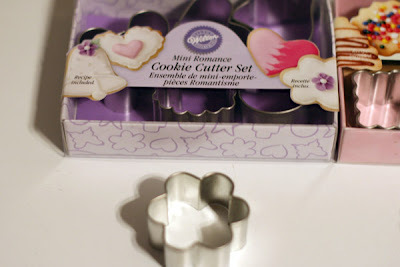 In the meantime, any suggestions for what to do with the other 11 cookie cutters that come in the tin? They just seem so small for making normal cookies. 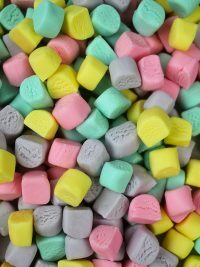 Emily – you can get light blue candy melts at hobby lobby or michaels or even online at amazon. van – I use the cream cheese ready made frosting or the recipe here for homemade. Jeff and Linnea – You are lucky. Congrats on the great score. I definitely want to see the finished product. And, If you decorate cakes with fondant, the little cutters are great for cutting shapes.  hi ever sens i saw the show on tv i have been enchanted by this wonderful pops! 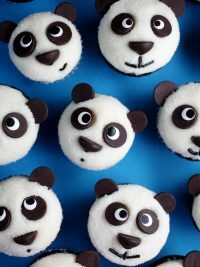 I’m going to make them for my husbands birthday. but as I’m not from the states i am confused about the chocolate bark, how many ounce/grams is there in one package? i just don’t know what the right amount is to buy! I made the pops and they turned out great, my family and friends loved them. They were a little moist for me, I’m a texture person….SO the next time I just used less frosting and they were perfect. 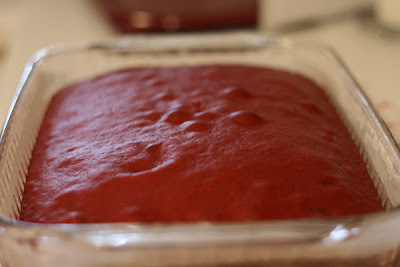 So for those of you who don’t want them to moist just use less, easy peasy! The only thing I did notice with using less is during my dipping stage, I put them in the freezer half way through just so they would remain firm. Also my friends wanted to know where I came up with these cute cupcake pops…and I said a friend…do I really have to let all my secrets out of the bag? LOL After feeling guilty for not telling them about the gold mind I found I sent your blog out…I guess some secrets are meant to be shared! PS. 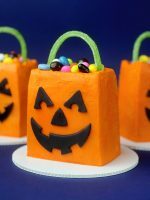 Could you post some pies or cakes for the up coming holidays…I would love to try something new this Halloween/Thanksgiving. emelie (frusolli) – no problem, emelie. rebecca – I probably would do the same thing. At least for a little while. And I’m glad you figured out the frosting fix. Sometimes it just depends on the cake and how high it bakes. The more cake, the more likely you’ll use the whole can of frosting. And, I can’t believe it’s almost time for the holidays. Guess I better get baking. Bakerella, I loved the look of your chocolate cake on the Martha Stewart Show. It looked so dense and lovely. 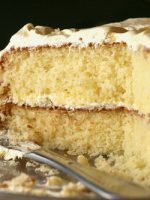 Do you have an equally wonderful yellow cake recipe that you wouldn’t mind sharing? Thank you. Holy Mackerel, these are quite possibly the cutest things I have ever seen. I will be making some, for certain, for my daughter’s class for her birthday! What a darling idea! Tammy – I wish. I do have one that I’m going to try soon, so if it’s good, it will go up! nosmallthing – thanks a bunch! 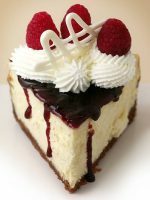 can i use regular frosting instead of cream cheese? Hi Bakerella….  Am very addicted to your blog. I am from Singapore and we dun have Chocolate Bark. What can I replace it with. What is the purpose for it. Can I omit it? Love to try it this Thur…. 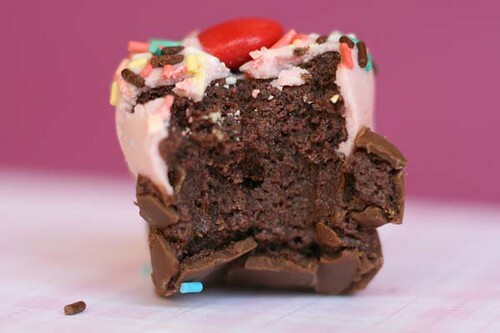 Could I use a Devil’s Food Choc recipe to achieve this cupcake pops…..
My hands are itchy, waiting to get all ingredients b4 I start. Emily – Yes. You can use the flavor that goes with the cake you are making. You can use the cake and frosting combo of your choice. Nancy – that’s a cute idea. I forgot how much I looove those. Especially the chocolate munchkins. And I like them heated a little in the microwave too. You know what, I think I have to go to the store now. I just love these! Someone made them for a meeting I attended last month and I had to learn how to do it. I like using the chocolate bark rather than the candy melts because it goes on thinner and smoother. However, it’s so hard to bite into. So, I wanted to share my solution with you: I melted the chocolate bark (3 squares at a time) with 2-3 tablespoons of peanut butter. 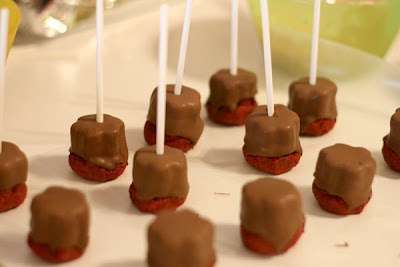 On a dark chocolate cake ball or cupcake pop, the peanut butter chocolate coating sure is yummy! My favorite melting chocolate is the Ghirardelli baking bars, and using the peanut butter tip, I think that chocolate will work also. Thanks for the cupcake pop idea! When I’m in a rush I make the cake balls instead of cupcake pops. Yum yum yum. And if you have a Kroger, try their candy coating. It’s pretty much the same texture as the melts I use. Nancy – you can add a drop or two of oil to help thin it out or add a few paramount crystals. 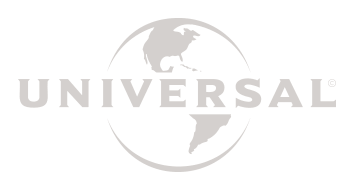 What brand are you using? If you are using Wilton, try mercken’s or make n mold. Also, if heating in the microwave. Make sure to heat in 30 sec intervals, and stir in between. How darling are these?!?! and just in time for my daughters birthday party! Nancy & Ty Mackey – hope she likes them. I’m so glad aimee – this is a fun project for kids. Glad it passed the test. Thanks for all of the great ideas! I am curious how these would turn out if I used marshmallow fluff instead of frosting? Great job on these. I don’t really like the fluff, but if you try it, let me know if you like it. These were actually pretty bad tasting. I think they need less frosting or something. It just tasted like dough. i”m not a baker…but I might have to try this!!! my next birthdays are nov and March…I have a mastectomy at the end of the month…so by march i might be able to pull this off….thanks for sharing!!! Julie – try adding less next time. And give them another try tomorow. They taste better to me the second day. Happy House Quilts – you’re welcome and good luck! Amy – Thanks Amy! As long as you give credit and links, I’m happy. I found chocolate bark at a store nearby and don’t really want to have to pay extra for shipping especially if im trying to get it way before halloween. 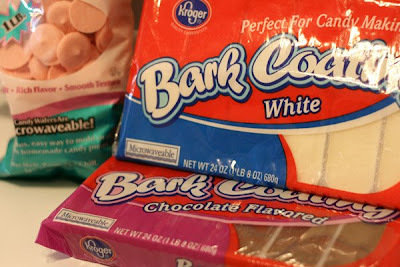 Do you think i could add food coloring to the white chocolate bark? After it melts maybe? You can add food coloring, but it has to be a special kind to color candy. It can’t contain any water. ooh thanks! and if you dont mind me asking would you know any specific brands i can look for for of non liquid food coloring? and they would usually come in a gel or paste right? i mean if not in liquid. I made these the other day and they turned out great! Everyone loved them. They are so cute! Thanks for the great idea! Check them out on my blog if you’d like. Great job Amy. Looks like they came out perfect. Thanks for the recipe. I made this little gems for my sister's bridal shower, using her wedding colors. They were a smash hit. I got kind of tired halfway through and used heart cutters. I had half hearts and half cupcakes. Fatty – love the colors. Glad they were a hit! Bakerella, I love your blog. 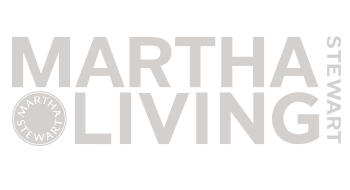 Ever since I saw you on Martha I’ve been checking it out regularly. I finally got together all the stuff I needed to make the cupcake pops with my kids. Unfortunately, I think I added too much frosting to my cake crumbs because the pops were too soft and kept falling off the sticks when we tried to dip them (no matter how long we kept them in the freezer to harden). Also, do you have any other ideas about what I can add to the cake crumbs besides for frosting? One of my kids are allergic to dairy and I’m looking for a non dairy alternative. peggy p email me your process. Did you make cupcake shapes or round ones. The cupcakes really can’t fall off. But if you did the cake pops (round) there’s a chance. Try using less frosting. You can add more if you need it. The balls should hold their shape when rolled. If they don’t you probably used too much frosting. Stick in straight, not at an angle. Remove one or two at a time to work with in your chocolate so the rest don’t lose their firmness. Your chocolate should not be too hot. 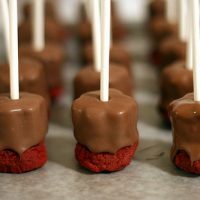 When you dip them, make sure the chocolate surrounds the pop at the base of the stick to help secure it. Instead of dipping the top I swirled it like you would with real frosting to give it a normal cupcake look. On the inside I went with extra butter yellow cake with cream cheese frosting and the combo of that with the chocolate, they taste like cookie dough! I boxed them some really cute semi transparent zebra print chinese takeout boxes I found at the craft store. MissLiz – I have that mold too. These look really good. Thanks for sharing! 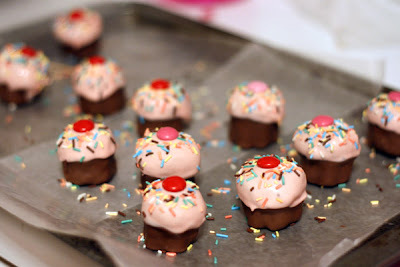 Easy & great recipe and great cupcake bites…my husband I made them yesterday and it was a lot of fun to do as a team! Thanks! Wonderful recipe! This was the perfect tutorial. Your tips were spot on. I love funky little twists on simple recipes and this hits the mark. I just made a batch with red and green sprinkles for the holidays. Thank you so much for sharing your style with us! littlestace – that’s awesome. It’s def easier if you have help. Kim Herring – me too. I’m glad you liked this one. You are genius!!! I just made the red velvet pops for a christmas party with white chocolate and crushed candy canes on top. Just and idea…. I used a potato masher to mix the frosting and cake together. It was totally mess free and fast!!!! I made these and they were quite time consuming, but sooooo worth it. They were delicious, and people were swooning over them. I got enough compliments to make me feel like the four hours that I spent making them was not four hours of my time that was wasted. I posted pictures of mine today on my blog. Instead of using sticks, I just placed each one in a teeny tiny martini glass (plastic) that I found at Target in the dollar section, 3 for $1. Mrs. F – Glad it was worth it. They get easier and a little faster when you do them again. What a disappointment. These were a total waste of time and money, and I can’t believe I spent so long on making them. My friend and I made these for a bake sale, and I thought I’d make a separate batch for another friend’s birthday while we were at it. I read all the positive reviews, so I thought they’d turn out okay. Now that I think about it, only a few people actually MADE the pops and commented while the rest were going on about how cute they looked without having tried the recipe. First, the process was way too time-consuming. There are a lot of mistakes that are possible; if these at least tasted okay, I would think it’s fine to learn as you make the pops again and learn from the past. But then there’s the awful texture and taste. Sure, these look pretty enough. But when you actually eat them, it’s like biting into something raw. Everyone thought they were made out of uncooked dough. That combined with the low quality chocolate… it gave us a stomachache. Perhaps with better, gourmet chocolate, the pops would be better. However it’s totally not worth it. My mom even suggested they were the worst things she’s ever eaten… and then offered to buy a birthday cake for my friend tomorrow morning so I wouldn’t have to give her these. Thank god we made chocolate chip cookies for the bakesale too, so we have something to contribute. I’m so angry about all that money I spent and my own energy that went into those awful cake pops. I’m never trusting recipes from the internet again! From now on, I’m sticking with cookbooks. Anonymous – Sorry you didn’t like them… you might be the first. I’m thinking you might have done something wrong. i’d love to make these, but I’m vegan. 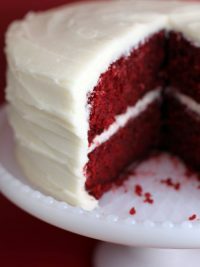 I have a great cake recipe I could use, but I was wondering what you’d suggest to replace the cream cheese frosting with. I have a buttercream frosting recipe I could use instead, would that work, or is the cream cheese the key ? Also, would plain old chocolate chips work in place of chocolate bark? Or do you have another suggestion? Thanks so much ! you’re fantastic. Emma Lee – You can definitely use a different frosting. I just like that combo. 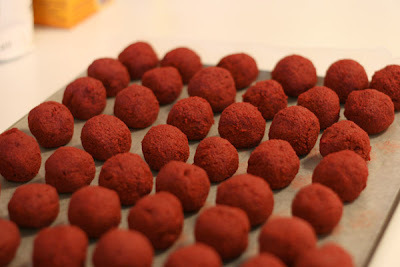 For the chocolate, the coating really is easier to work with and it doesn’t melt when you hold them like the chips do. If you decide to try the chips though, have some vegetable oil on hand. You will probably need a few drops to help thin it out. Can I check if I could use baking chocolates? As chocolate melts and barks are hard to come by where I come from. I haven’t yet. But some have and just added a few drops of veg oil to make the chocolate thinner.